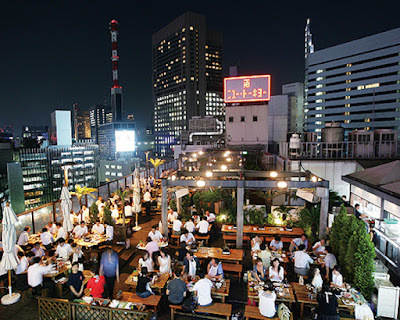 Beer Gardens are a wonderfully Japanese concept, very different from their European or US counterparts. During the summer months, when the heat and humidity make street life close to unbearable, many department stores provide an obvious solution. They open their roof gardens to the good and the thirsty of the city from mid-afternoon to late into the evening. For a fixed fee, usually $25~35, it's all-you-can-drink and, for a little more, they throw in all your gastronomic requirements as well. The pricing is clearly designed for the domestic market where the average person probably only quaffs a couple of beers over an evening. For gaijin, where many of us often carry a somewhat higher capacity tank, it is great value for money. You're out of the heat and the noise of the street, in many instances with a great view of the city and to add to the enjoyment, most Japanese get giggly (or sleepy) when tipsy. Which is always fun. Everyone occupies large, open, tables and, as the first glass or two go down, so do the inhibitions. Japanese can often be hesitant to talk to foreigners simply from the perspective of being embarrassed about using English. But it won't be long before conversations arise between the adjoining parties and as the evening comes to a close, new friends will have been made. And they might just know another, even better, beer garden on a roof that serves an equally refreshing summer nomihodia.